How would you like to throw a bag of vegetables in the microwave, open up two cans and drain, and have a fabulous salad ready in less than 10 minutes? This salad is colorful, delicious, and has a balanced mix of protein, carbohydrate, and fat. So if you don’t end up cooking anything else for dinner, you don’t have to lose any sleep over it. 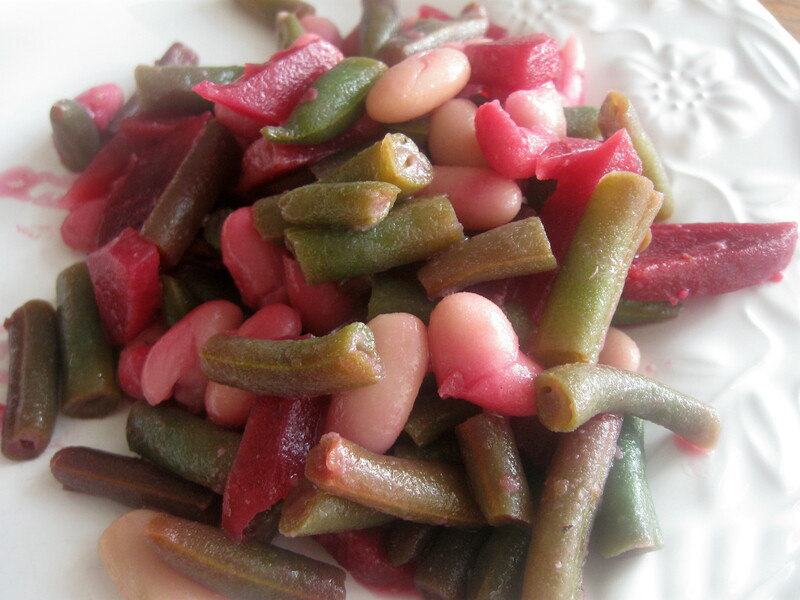 The salad tastes even better the next day, although the beets stain the white beans so that they’re pink. Besides the stain factor, this salad would make a great dish for any picnic. And I do believe it’s finally time for those fun summer picnics! Mix all ingredients in a bowl. Add salt and pepper to taste. Once again, my family did the cooking this weekend; I was spoiled! Some of you may be familiar with the Cosi Signature Salad featuring mixed greens, pears, grapes, dried cranberries, pistachio nuts, and gorgonzola cheese. My sister used this recipe to replicate the famous salad with a shallot vinaigrette dressing. The salad was colorful and delicious, with a variety of flavors and textures. The salad could easily be served on it’s own for a summertime lunch, but on this night it was the perfect complement to a special dinner! I was inspired by this recipe from Cooking Light, but think of this as a “Choose Your Own Adventure” style salad. Choose a pasta. Choose a variety of fresh vegetables, and don’t forget the avocado. Choose a fresh herb or two. And then toss it all together with a spicy buttermilk dressing. This combination in particular was good, but not spectacular. The salad needed something else – maybe some queso fresco, or perhaps something crunchy like pumpkin seeds. The buttermilk dressing has a nice kick, but be sure to make some extra so the salad isn’t dry. This was a fun adventure, but I’ll just choose a slightly different path next time! Mix orzo, tomatoes, pepper, scallions, mixed greens, and basil in a large bowl. In a small bowl whisk together buttermilk, lemon juice, yogurt, mayonnaise, spices, and garlic. Toss dressing and salad. Chill before serving. You can only live on Vegetable Pasta Salad for so long; eventually you have to make something else for dinner. I took a quick survey of ingredients on hand: shredded carrots in the refrigerator, shelled edamame in the freezer, and Japanese Roasted Sesame Oil in the cabinet. Using a recipe for Carrot Kinpara as inspiration, I threw together this dish. ‘Bento’ is a Japanese term which refers to a lunch box with sections for different foods. I don’t know whether you would really find a recipe like this in a section of a bento box, but let’s pretend. It’s spicy and flavorful, and could easily accompany a rice based dish. Although this satisfied my craving for dinner, I still think I need to head to a Japanese restaurant soon. Heat sesame oil in a small frying pan. Add carrots, and saute for 5-10 minutes. Add cayenne and stir. Add soy sauce and edamame and cook for 1-2 minutes more. Garnish with sesame seeds and serve. In traditional pasta salad, vegetables are usually an afterthought. You might add a little red pepper for color, or throw in some diced tomatoes or olives to add some bulk. But in this recipe adapted from Budget Bytes, the vegetables are really the star of the show. I used broccoli, yellow squash, zucchini, and carrots but the possibilities are endless. I wanted the broccoli, squash, and zucchini to be just slightly cooked, but you can leave them raw if you prefer a little more crunch. The pasta, vegetables, and beans are tossed in a creamy Ranch-style dressing. The original recipe suggests buying buttermilk, rather than making it using a splash of vinegar. I agree that store bought buttermilk has a much thicker consistency which would make the dressing richer, but I didn’t have any on hand so I made my own with non-fat milk. The original recipe also included fresh parsley, and I think any freshly chopped herbs would brighten up this salad, so next time I’ll try that as well. Still, this recipe made a large bowl which I enjoyed for several meals. Add whole wheat pasta to boiling water, and cook for 5 minutes. Add broccoli, and cook for 2 more minutes. Add yellow squash and zucchini to the pot, and cook for 1 minute more. Drain the pasta and vegetables and rinse in cool water. Allow to drain for a few minutes. In a large bowl, mix pasta, vegetables, shredded carrots, and beans. In a small bowl, mix buttermilk, mayonnaise, mustard and spices. Toss dressing with salad. Allow to chill before serving. I decided to try her latest recipe, Asparagus with Almonds and Yogurt Dressing. Ignore the fact that I used sliced almonds instead of whole, and my yogurt dressing ended up pinkish from the paprika. Also ignore the fact that I used a patterned plate for this busy dish, making it hard on the eyes. But don’t ignore the fact that there’s a glass of wine on the table, because it went very well with this delicious salad. I liked the combination of flavors here, and I only wish that there was more asparagus. Better buy two bunches next week! Yesterday’s soup may have lacked some flavor, but this recipe makes up for that, I promise! I saw this Rainbow Asian Slaw and thought it was so pretty. It reminded me of farmer’s markets in the summer, when you are surrounded by fresh vegetables of every color. We’re not quite there yet so I took a shortcut and used packaged slaw mix along with some extra carrots I had on hand. This recipe really is fantastic. The honey makes it a little sweet and the peanuts make it a little salty and you can taste the freshly minced ginger in every bite. I can’t wait to make it again this summer with some seasonal vegetables! Toss slaw, carrots, scallions, peanuts, and edamame in a large bowl. In a small bowl, whisk together remaining ingredients and use to dress the salad.